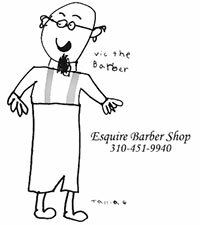 Esquire Barber Shop - Home of Vic the barber - Santa Monica, California. We are one of the two or three oldest businesses on Montana Avenue. 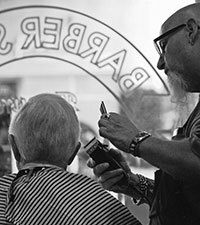 We opened in 1953 as Mike’s Barber Shop. We became Esquire around 1962 when a gentleman who owned two shops in downtown LA purchased this site and changed the name. I began here in 2000 after working at “Fathers Office” for seventeen years. Leo was the owner and had been here since the 1970s. When Leo retired I became the owner Most of our clients are neighborhood regulars although we do see a lot of tourists during the summer. To stay authentic. There are so many faux barber shops out there where you are more likely cut by a cosmetology apprentice than a barber no matter what their sign says or how many barber poles they have. We provide professional, friendly and reasonable services to our neighbors and friends. We are the kind of place that people feel comfortable just stopping in to say hello, sit a while and shoot the breeze. We are a full service barber shop offering shaves and haircuts for men and boys including the latest as well as old school styles. Our shaves are authentic, hot towel, hot lather and straight razor. Our shaves are straight razor start to finish. We also shave heads. 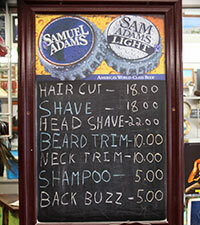 Our haircuts include neck, ear, eyebrow and nose trimming, shampoo and buzz cuts upon request. My associate June provides haircuts and styling for women and girls as well as men. Authentic barber shop shave, hot lather, hot towel and strait razor. Our haircuts include neck, ear, eyebrow and nose (if needed). Hair cuts and styling for women and girls. Give us a call or drop by. We are conveniently located in the Montana Shopping District. Come by and say hello we would love to see you. 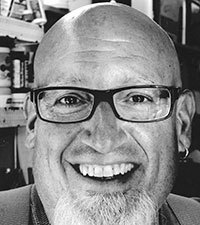 Vic was born at St Johns Hospital in 1956 and has lived in Santa Monica all of his life. First on Santa Monica boulevard at Euclid (it’s a used car lot today). Then on Pier Avenue at 11th and later at 10th and Idaho (now condos). After attending Kindergarten, Roosevelt, Saint Monica’s and Lincoln he was a member of the class of 1975 from Santa Monica High School. Vic has worked on Montana since 1979 starting at John’s Union Service Station (now Union Bank). He went on to work at Father’s Office for 17 years. In the 80s it was the neighborhood place with pool table, Juke Box, Foosball, Pinball and a cigarette machine in the corner. On any night 9 of the 10 people there were from the neighborhood. In 2000 he moved next door to the Esquire Barber Shop. Vic’s associate June is originally from Vietnam. She has been in the USA since 1992 and has worked at the Yellow Balloon and the Mart Barber Shop. June has been at Esquire since 2009. Home of Vic the barber.